DC Deck Building Game: Crossover Pack 6 – Birds of Prey is an expansion for The DC Deck Building Game by Matt Hyra and Nathaniel Yamaguchi, published by Cryptozoic Entertainment. It is for 2-5 players. This expansion adds 6 new Birds of Prey Super heroes to play with, 8 new Super-Villains to fight and a stack of new cards to add to the main deck. For those unfamiliar with the DC Deck Building game, let me give you a quick overview of how it’s played. Player will begin with a starting deck of 10 cards that include 7 punch cards and 3 vulnerabilities. They’ll also choose a starting Super Hero to begin the game with. They will place their Super Hero in front of themself and shuffle their starting deck of cards. Once shuffled they will draw 5 cards to create their starting hand. On a player’s turn, they will play the cards from their hand in any order they choose, making it possible to buy a card or cards from the lineup using the power generated by their cards. They can also use their power to defeat the current super villain. Each time they gain cards they will be beefing up their deck and making it more powerful so that they can create more power and earn more points to be able to defeat even more powerful villains and buy even stronger cards. Of course, their Super Hero card will also provide them with a special ability that will help them during their turn. The game will continue until one the very last Super Villain in the Super Villain deck is defeated. Once that happens, players will add up their victory points and the one with the most points is the winner. Now, with a basic understanding of how the game works, what all does this expansion add as far as content? First off let’s look at the all new Super Hero cards. These are the oversized cards that each player will choose one at the beginning of the game to use as their starting hero. The heroes in this expansion are all female and will be easily recognizable to any fans of the Birds of Prey comic series. Heroes such as Black Canary, Oracle and Catwoman, as well as Katana, Huntress and Batwoman. The expansion also includes 8 new Super Villains for the heroes to battle, including Harley Quinn and Poison Ivy to name a few. There’s also 23 new cards for the main deck including new equipment, super power, heroes and villains. The setup for using this expansion is pretty straight forward. Each player chooses one of the Birds of Prey Super Heroes to use. They then should choose one of the big box sets for the game and shuffle the main deck from it. I would personally recommend the Teen Titans set. Once the cards are shuffled the deck should be split in half. Players choose one of the 2 halves to use and shuffle the new Birds of Prey cards into it. This stack is then placed on top of the other half of the main deck. This makes sure that there are more of the Birds of Prey cards available for the lineup. Next, the Super Villains should be arranged in cost order from 8 to 15. The card with the blue back should be placed on the bottom of this stack. Everything else about the game remains the same. In this expansion there is a brand new concept that hasn’t been seen in any of the other big box sets or expansions. That is the idea of rotated cards. What this means is that some cards and hero abilities will allow a player to rotate their cards to gain positive effects and combos. The effect is gained by rotating the card 90 degrees. These rotated cards still function as normal, even though they’re rotated. It should be noted that cards can only be rotated if an effect tells the player that they can do it and that a player’s Super Hero card can not be rotated. Once the card has been rotated, the effect is resolved. Some effects will grant huge bonuses for when the card rotates upright. What this means is that the card has usually been rotated 4 times to return to the upright position that all cards enter play in. Ongoing cards such as Locations and several of the new cards introduced in this expansion are the best cards to use the new rotation effect on. This expansion has lots of new content. As I mentioned earlier, there are 6 new oversized Super Heroes, 8 new Super Villains and 23 new main deck cards. I absolutely love the artwork on these. Each one has some amazing look designs and feature heroes and villains from throughout the DC universe. I’ll be honest, I was amazed that in the entire expansion, there’s only 1 card for a male character. I won’t say who that particular character is, it might ruin the surprise. It was just nice to see that almost this entire expansion is dedicated to female heroes and villains. Well done, well done! I will mention however that there will be some familiar faces especially for anyone familiar with any of the DC shows on the CW. Characters such as Roulette, Cupid and Vixen make an appearance. I was really happy to see a lot of great looking cards. I really feel that the new cards work well together and thematically they fit. Overall, I’m very pleased with the look and feel of the entire expansion. The rulebook for this expansion consists of a simple rules card. It is the size of one of the oversized super hero cards. This card covers all the rules for adding this expansion to any of the boxed sets. It also covers the new new rotated cards concept, explaining it thoroughly. It also includes a couple of pictures showing this concept. There are also some clarifications on several of the cards included in the set. I think that the card does a great job of explaining everything. It’s easy to read and understand. It’s also good for separating the sets inside one of the big boxes. Overall I feel it covers everything quite well. It’s no secret that I love deck building games and that the DC Deck Building Game is absolutely one of my most favorite ones. I’m also a big fan of DC comics and love all the many characters and stories. It should come as no surprise then that I would enjoy this expansion as much as I do. I’ve always enjoyed the Birds of Prey, especially Black Canary, Huntress and Oracle. It’s nice seeing these as playable characters, even though Black Canary had already been a part of a previous big box set. I’m also very happy about seeing Catwoman as a playable character. Honestly, it’s about time. I think she fits in well with the others and really rounds out the line up. Of course let’s not forget Katana and Batwoman. These 2 are also quite cool and are a lot of fun to play. As for the actual gameplay, the new concept for this expansion is the rotated cards that I’ve explained pretty thoroughly in other parts of this review. The idea of rotating the cards is actually a pretty cool concept for many of the ongoing cards like locations and such. Each time a card is rotated it may provide a bonus from another card which can help out quite a bit. Thematically it’s a little unusual until you play a card like the villain Roulette and you suddenly get it. I have to say that a ton of praise should be heaped on the designers for having the courage to make an expansion where there’s only 1 male character card in the whole package. I think it’s pretty brave and makes sense in this expansion that’s clearly centered around the Birds of Prey. I like this set a lot. It’s a lot of fun to play. Fans of the DC Deck Building Game will love this expansion and all the new material that it brings to the game. Fans of the Birds of Prey comics and even the DC TV shows should enjoy this one as well. I would highly recommend this expansion. It’s a definite must have for me. 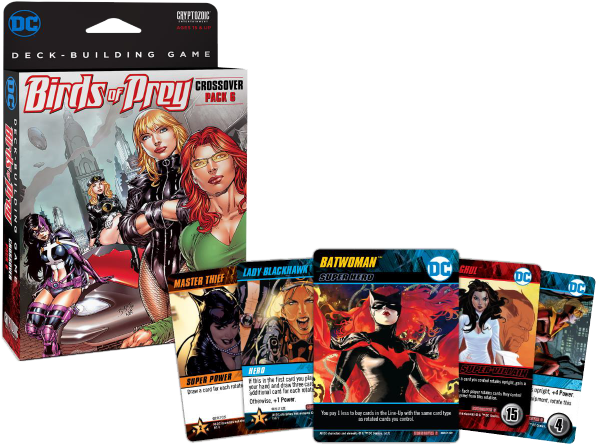 DC Deck Building Game: Crossover Pack 6 – Birds of Prey is an expansion for The DC Deck Building Game. It adds 6 new playable Super Heroes, 8 new Super Villains to battle and 23 new cards for the main deck that are centered around the Birds of Prey and several of the female characters of the DC Universe. The expansion doesn’t really add much more time to the actual game play. It’s fairly negligible. Most game sessions last around 45 minutes, depending on the number of players. The cards are beautiful. Each one captures the look and feel of the comics in a great way. I relly love the look of the designs and art on each one of these. The expansion also adds a new concept to the game, the rotated cards. I think it works quite well with the cards in the expansion as well as those in the Teen Titans set. I’m very happy with everything that the expansion has to offer and look forward to playing it a lot more. Fans of the DC Deck Building Game and the Birds of Prey comic series will be happy to add this to their collection. I highly recommend it. It’s a must have. This entry was posted in Reviews and tagged 6, birds, birds of prey, board, board games, building, card, card games, crossover, cryptozoic, cryptozoic entertainment, dc, deck, entertainment, games, hyra, matt, matt hyra, nathaniel, nathaniel yamaguchi, pack, prey, yamaguchi. Bookmark the permalink. I think this expansion is pretty cool with the card rotating mechanic, however to fully experience the power of the Birds of Prey Crossover, you need to have plenty of ongoing cards to be able to affect, otherwise you really only have locations that are ongoing. So, Teen Titans is the set to use this with. But, herein lies the problem. Teen Titans set has LOTS of cards with ONGOING keyword. With the Teen Titans, things get really powerful really fast. Turns can become very long with huge card combos, and if you are rotating a lot of cards and they turn upright triggering bonus actions that prolongs the turn. This leads to runaway leader issues and a lot of downtime that leads to player disengagement.